Blog @DrBenFung: Applications: Musashi's "Book of Five Rings"
This post continues from my Martial Arts Musings with Sun Tzu's Art of War. You can find my related posts under the Martial Arts label. Miyamoto Musashi was a legendary samurai duelist who independently studied into an epic level of skill and understanding. Winning his first duel at 13 and retiring from dueling at age 29, this Japanese swordsman boasts over 60 victories. Now mind you, in the age and culture during Musashi's time, the Japanese did not fight to first blood - swordplay was to the death. I think from just this fact alone with surviving 60 life & death encounters, there is much to be learned from his philosophies. This, of course, is part of the irony since Musashi wrote his book as a first draft, top-of-the-mind memoir on his career, his martial arts school, and his philosophy & approach in life. The Book of Five Rings, perhaps better translated as the Book of Five Sphere - or perhaps even, "Five Worlds/Realms" - is Musashi's retiring thoughts as a martial arts teacher, reflecting on his career as an samurai ronin and duelist. This book is noted by many law professors, political scientists, business schools, and military academies - the content most useful concentrating on one to one combat encounters and expanding into the battlefield at large. There are many lessons in this book which can be applied in life and is readily applicable to best practices. Below is a list of my favorite quotes and excerpts for which I will also add my own thoughts. "The field of martial arts is particularly rife with flamboyant showmanship, with commercial popularization and profiteering on the part of both those who teach the science and those who study it. The result of this must be, as someone said, that 'amateuristic martial arts are the source of serious wounds.'" Musashi was obviously a man and mind far beyond his times. It was only in the last century that martial arts have truly become blended and unified into functional terms. Mixed martial arts, as we know it in recent times, has really taught us that things that look impressive tend to perform terribly. Another saying that I've heard of is: "Looks good, tastes terrible; looks bad, tastes great!" "When your life is on the line, you want to make use of all your tools. No warrior should be willing to die with swords at his side, without having made use of his tools." I'd like to point out that Musashi was famous for using two swords even though, traditionally at the time, only the single long sword (katana) was used in Japanese combat. This struck me as an important philosophical point; Musashi practiced that which worked - even if it wasn't popular or accepted. He studied and refined that which demonstrated repeated success. "In distinguishing the advantages of the tools of warriors, we find that whatever the weapon, there is a time and situation in which it is appropriate. 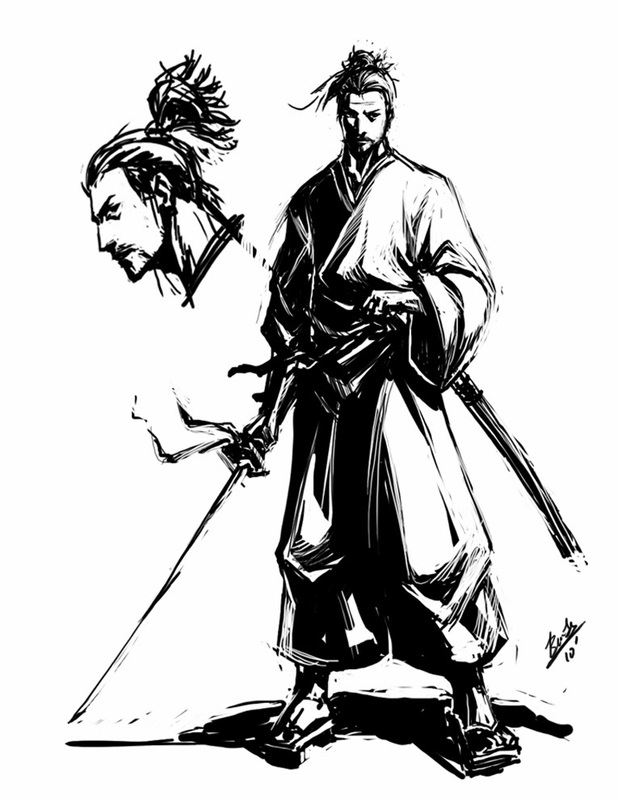 The side arm, or short sword, is mostly advantageous in confined places..."
Musashi goes on to list Japanese weapons and purposes... it goes to show that he understood beyond what he specialized in. You can always specialize in one area; however, it is important to be familiar with all aspects in any field. This culturally mirrors teachings of Sun Tzu - you must know your enemy as well as yourself. "You should not have any special fondness for a particular weapon, or anything else, for that matter. Too much is the same as not enough... Pragmatic thinking is essential." In combat, business, clinical thought, and life in general - flexible common sense is key. Being too terribly structured & unable to think outside the box is a mind trap for the self. "Generally speaking, fixation and binding are to be avoided, in both the sword and the hand. Fixation is the way to death, fluidity is the way to life." "Be water, my friend" - Bruce Lee. Enough said. "Holding down the pillow means not letting someone raise his head." "If you consciously try to thwart opponents, you are already late. First, doing whatever you do scientifically, thwart the opponent's very first impulse to try something, thus foiling everything. To manipulate opponents in this way is mastery of the art of war, which comes from practice. The act of holding down the pillow requires thorough examination." I love this concept. Musashi touches on this several times in his book. When in conflict, it is of paramount importance that once engaged, you pressure your opponent so that they have to keep their head down. This keeps them on the defense, and, positionally - you on not just the offense but in a place where the opponent can't even hope to counter attack. A popular sportive aspect we see this applied in; American football. "To 'cross the ford," puts the adversary in a weak position... then you will generally quickly prevail." In Chinese Chess, there is a structure on the gameboard called the "river crossing" or "ford." In this, if an army cross the ford first, and can maintain position - this pressures the defending army in a manner where the consciousness can only focus on the pressure and not the tactical situation at hand. My thoughts are that similar cultural constructs exist - if not borrowed in the point in history - in Japanese cultures during the time of Musashi. "Also, in individual martial arts, you determine opponents' traditions, observe the person character of adversaries, find out people's strengths and weaknesses, maneuver in ways contrary to opponents' expectations, determine opponents' highs and lows, ascertain the rhythms in between, and make the first move; this is essential." More of "know your enemy and know yourself." "Stomping is not only done with the feet. You should also learn to "stomp" with your body, "stomp" with your mind, and of course "stomp" with a sword, in such a way as to prevent opponents from making a second move." It is important to remember that many Asian languages are highly metaphoric and figurative; I feel this conceptually has much to do with "holding down the pillow." Once you engage your opponent, it is important to stomp, step, and apply pressure to your enemy so that they are so cornered and overwhelmed, they are not mentally able to make another move. "When you think you are going to get into a deadlock, you stop that right away and seize victory by taking advantage of a different approach." We've seen this in large scale battles. Battle lines such as the Battle of the Bulge or any of World War I's trench warfare show how detrimental deadlocks are for both sides. If you find yourself in a mutual clinch of any sort, it is imperative to break the stalemate and immediately re-engage your opponent before they can react. "When your opponent is not as skilled as you are, or when his rhythm is fouled up, or when he starts to back off, it is essential not to let him catch his breath. Mow him right down without even giving him time to blink his eyes." Again, more of keeping the pressure on the enemy. Don't let up! "When an excessive number of sword moves are taught, it must be to commercialize the art and impress beginners with knowledge of many moves with a sword. This attitude is to be avoided in military science. This goes back to the flashy style of useless schools of thought. I think this is highly applicable to all types of business, clinical, and academic philosophical operands. I find this particularly true for intellectual reasoning. Schools of thought that seem to make more of a situation than is truly required - as if such thoughts were above its competitors... such patterns, I've observed, result in a xenophobic, elitist attitude. In the martial arts world, we see this quite frequently - some grandmaster of a sub-sect of a school never heard of. And yet, the school has many, many students. They square off with a blue belt from another school and get worked. Substance? I think not. "The performance of an expert seems relaxed but does not leave any gaps. The actions of trained people do not seem rushed." For those of you who grapple - especially in Brazilian Jiu Jitsu - it's as if the higher the belt level, the slower people roll. And, no matter what you do, you still feel like you are out of control, steps behind, and out of position against this slow-as-molasses moving brown belt who is trapping you at every corner. It goes to show: mastery can be performed at any speed - at any time. "It is bias to think that the art of war is just for killing people. It is not to kill people, it is to kill evil. It is a strategy to give life to many people by killing the evil of one person." I appreciate this quote from Musashi. I've actually left out some of Musashi's more graphic quotes from his book since I felt the content was not entirely congruent with the presence of this blog. Nevertheless, I think it worth pointing out that the Japanese consider their primary sword, the katana, as the "life giving sword" - recognizing that violence is inevitable in human history (the human condition), and thus its future. Therefore, the only way to preserve life is to defend it, and, to defeat those who wish to take life from others. "When you strike a blow, do not let your mind dally on it, not cerning yourself with whether or not it is a telling blow; you should strike again and again, over and over, even four and five times. The thing is not to let the opponent even raise his head." Once again, the holding down the pillow, snuffing out the opponent with pressure concept. I think this happens to many of us when we are at the moment of truth. We take our eyes off the ball to see where it went... well... it went no where because we took our eyes off the ball. Keep on it and never lose focus on until the job is done. THEN take a look at where the ball went. "When you wield a sword, if you are conscious of wielding a sword, your offense will be unstable. When you are writing, if you are conscious of writing, your pen will be unsteady. Even when you are playing the harp, if you are conscious of playing, the tune will be off." An expression of true mastery can be seen in the uniting the tool, the wielder's body, and the mind - all as one. The art must become part of the consciousness of the student - only then, do they begin mastering the art. Learn what works, not what looks good. Practice them. Master them. And, apply their lessons. When you engage an opponent, ultimate victory occurs because you have out-maneuvered your opponent so much so that they are mentally pressured out from the fight, physically out of position, and tactically incapable of striking back - rendering you safe from the beginning of the encounter. Teachings that trump superiority typically lack in substance; they are only at words - not deeds. Teachings which only offer the truth that their methods work in the circumstances for which they've mastered - these systems are functional. They work for their intended purposes. These can be trusted and are worth studying. Intercept your opponent as they are on their way to attack you; strike them before their strike lands; beat them back with pressure as they retreat; crush them when they stop; take advantage of their weaknesses and avoid their strengths. I hope you've enjoyed this episode of Martial Arts Musings. Until next time! An essay should not be longer than 500-600 words. If you are looking for the help in writing, see college apps iphone right now. I found a link to this post while searching for ohsu physician assistant. This is exactly the kind of thing I want to see while looking into whether or not diving into a program is a good idea. Chinese are the best in martial arts so as they have stories of the same type. Martial art is a good game and there are any chinese legends who are famous among whole world. The study of natural chemistry for the AP senior high school as well as university level can be promoted with the aid of multimedia sources. There are several such organic chemistry material, offered online both totally free and also as commercial variations. chemistry assignment help is the best and best way to prepare your chemistry assignment, statement, research papers etc.